GameStop Expo conference hits the internet. “We’ve forged great third-party partnerships with some of the biggest developers to bring exclusive game content to PlayStation gamers which creates the best place to play,” Coleman said. This list, which we’ve typed up below, spans companies like Activision Blizzard to Atlus to Level-5 to Rockstar Games. 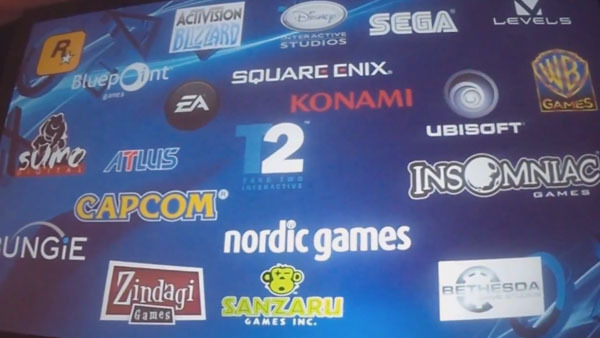 We’ve attached known PlayStation-exclusive content to each company. The rest are a mystery, as “game content” can mean anything from an additional 60 minutes of gameplay like Watch Dogs or Assassin’s Creed IV: Black Flag to a fully exclusive game like Deep Down. Talking up the console’s new camera, Coleman revealed the $60 add-on will support navigational voice commands, facial recognition, and body movement tracking. Watch the full presentation, courtesy of NeoGAF, below.